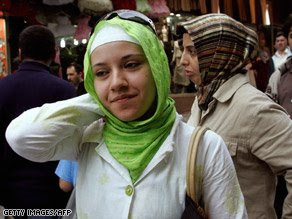 It's rare to see Turkish girls wearing shaylas, but it seems bright green ones are a popular option. And while it's nice to have a little height to your hijab, the beehive look in the first picture is just tooooo much! 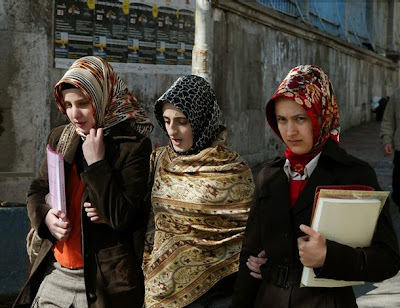 I wonder how they get the tops of their hijabs to go round and stiff like a bonnet? Is there some kind of foam thing they put inside? I LOVE this!! I think you need to start a new category for styles like this called "Hijab Boho Chic"! In all seriousness, though, I actually think that a hijab goes really well with that bohemian look, because it gives it a kind of folksy, gypsy-ish vibe. You can see what I'm trying to explain in the first photo. The way those girls pair the scarves with the patterned long blouses is seriously cool! I think it shows a great way to carry that bohemian look into the colder months. besides the scarfs and stuff, can u shw us how to put on the niqaab the arab way.. the way its done in saudi, with the black scarf over the top of the head!!! Ammena, check out the second style I posted under 'Malaysian Hijab Styles'. Also, when you fold the scarf into a triangle, make the fold as minimal as possible, so you get a bigger area to work with. I'll post mroe Turkish styles with chest coverage inshallah! Anchibride, my thoughts exactly, these girls have that Autumn trend sorted! Anon, I haven't a clue lol I'll look into for you. Habayeb, in your affiliate page, go to 'banners/links', click on graphic banners, then you see all the ones avaiable, and their HTML codes are next to each one under 'show banner code'. Fateme, thanks for the link! the cone head look is awful!!!! hehehe... couldn't be more agree with you jana, the "beehive look" lollz! liked the 1st one. the way they match their hijab with their dress looks really cool. 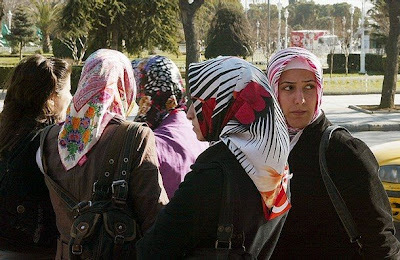 could u do some post on where to get such scarf in turkey?